This version of the model has been curated by Penny Noble and is known to run in COR and PCEnv to replicate the published results. Units have been checked and they are balanced. ABSTRACT: A mathematical model for the electrophysiological responses of a rabbit sinoatrial node cell that is based on whole cell recordings from enzymatically isolated single pacemaker cells at 37 degrees C has been developed. 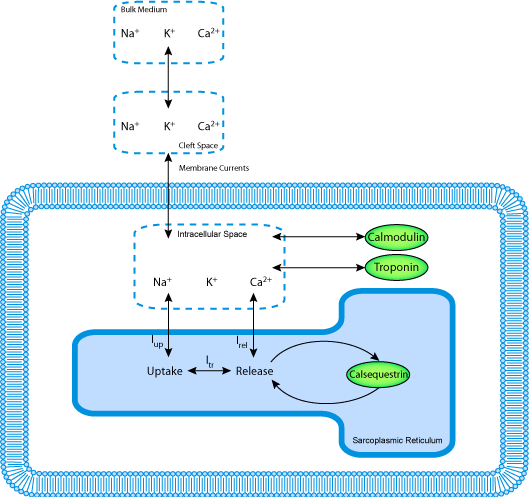 The ion channels, Na(+)-K+ and Ca2+ pumps, and Na(+)-Ca2+ exchanger in the surface membrane (sarcolemma) are described using equations for these known currents in mammalian pacemaker cells. The extracellular environment is treated as a diffusion-limited space, and the myoplasm contains Ca(2+)-binding proteins (calmodulin and troponin). Original features of this model include 1) new equations for the hyperpolarization-activated inward current, 2) assessment of the role of the transient-type Ca2+ current during pacemaker depolarization, 3) inclusion of an Na+ current based on recent experimental data, and 4) demonstration of the possible influence of pump and exchanger currents and background currents on the pacemaker rate. This model provides acceptable fits to voltage-clamp and action potential data and can be used to seek biophysically based explanations of the electrophysiological activity in the rabbit sinoatrial node cell. A schematic diagram describing the current flows across the cell membrane that are captured in the Demir et al 1994 model of the electrophysiological activity in a SA node cell. Derived from workspace Demir, Clark, Giles, Murphey, 1994 at changeset 1808cdc3fbc7.